We have published a more recent review of this organization. See our most recent report on Malaria Consortium's seasonal malaria chemoprevention program. Malaria Consortium's seasonal malaria chemoprevention program is one of our top-rated charities and we believe that it offers donors an outstanding opportunity to accomplish good with their donations. Is there room for more funding? We believe that Malaria Consortium could productively use more funding than it expects to receive to scale up its SMC activities. It appears that there is a large remaining global need for additional funding for SMC programs. (More) December 2017 update: In November 2017, we recommended that Good Ventures give &dollar;27.9 million to Malaria Consortium. After accounting for this grant, we expect that Malaria Consortium will continue to have a funding gap for 2018-2020 on the order of tens of millions of dollars. Details below. How accurate are surveys that aim to determine what portion of children targeted by the program received and took SMC? Will Malaria Consortium-supported SMC programs be able to achieve high levels of coverage in the future? Will Malaria Consortium's monitoring provide high-quality evidence of its programs' impact? Will other large funders fill the remaining funding gaps for SMC? Based on information from Malaria Consortium, we think this is unlikely in the next couple of years, but there is uncertainty because SMC may become a higher priority for governments and funders in the future. Is SMC an effective intervention? Is Malaria Consortium working in areas suitable for SMC? Are targeted children being reached? Have malaria rates decreased in targeted populations? We began speaking to Malaria Consortium about the possibility of reviewing one of its programs in January 2016. Over the next several months we tried to determine which of Malaria Consortium's programs we should prioritize evaluating for a possible recommendation, and we ultimately settled on seasonal malaria chemoprevention (SMC). The other programs that we investigated included: bed nets, deworming, dengue control, injectable artesunate for severe malaria, integrated community case management (ICCM), micronutrient powders, malnutrition management, neglected tropical diseases morbidity management, integration of nutrition with SMC, diagnosis of malaria, and diagnosis of pneumonia. Reviewed documents that Malaria Consortium shared with us. Malaria Consortium instructs CHWs not to give treatment to children who: are younger than 3 months or older than 59 months; have a fever or are severely ill (these children should be referred to the local health facility); are taking another sulfa-based medication such as cotrimoxazole; have received another dose of AQ or SP during the past month; or have an allergy to a sulfa-based medication, AQ, or SP.25 Malaria Consortium told us that CHWs are trained to follow a checklist, which is translated into local languages, in order to check for these issues.26 We do not know how often CHWs follow all of the suggested instructions in practice. Malaria Consortium notes that program supervisors oversee CHWs and that CHWs are surveyed about their compliance.27 We have not yet investigated the methodology behind supervision in SMC programs and do not believe that CHW self-reporting is likely to be reliable on this question. ACCESS-SMC: Unitaid awarded up to &dollar;67 million to Malaria Consortium to lead a project to reach up to 7 million children per year in seven countries in the Sahel region of Africa.35 In May 2014, Malaria Consortium wrote that this was the "largest-yet global programme" for SMC.36 ACCESS-SMC was led by Malaria Consortium, with Catholic Relief Services as the "primary sub-grantee" and support from many other organizations, including impact evaluation from the London School of Hygiene & Tropical Medicine (LSHTM).37 Malaria Consortium told us that its role in ACCESS-SMC included leading implementation of SMC in three of the seven ACCESS-SMC countries (Burkina Faso, Chad, and Nigeria), overseeing budgets and planning for all ACCESS-SMC activities, and overseeing research (including methodology and presentation).38 Our impression is that ACCESS-SMC pays for almost all aspects of program implementation and monitoring, including medicines and supplies, per diems for CHWs, training for CHWs, trainers, supervisors, and health facility workers, and research.39 Malaria Consortium shared the following source with us to help explain its staff structure: ACCESS-SMC, organizational structure. We have seen spending data from 2016 for the ACCESS-SMC program43 and some projected spending for programs supported by the GiveWell-directed funds that Malaria Consortium received by early 2017.44 It is our understanding that these are the main two SMC programs that Malaria Consortium works on as of 2017. In 2016, direct costs for the ACCESS-SMC program went to: 37% to procuring SMC drugs, 37% to delivery of drugs, 16% to staff (including staff at partner organizations), 5% to "direct common costs" (we're not sure what this refers to), and the remaining 5% to a variety of smaller activities. We also provide some information on the estimated cost-per-treatment of Malaria Consortium-supported SMC programs below. Monitoring, evaluation and research, including Malaria Consortium staff who directly observe program activities, and funding and coordinating with a university to conduct coverage surveys and to track changes in malaria incidence and death, monitoring of drug resistance, and other research. Malaria Consortium-supported SMC programs are focused on delivering treatments that have been independently studied in rigorous trials and found to be effective. Malaria Consortium and its partners have conducted monitoring to determine what proportion of children targeted by its SMC programs receive treatments. We have seen headline results from coverage surveys for 2015 and 2016 distributions in all seven ACCESS-SMC countries and early results from 2017 programs. A weighted average of the ACCESS-SMC surveys finds that about 91% of children received at least one month of SMC treatment, about 69% received three months of treatment, and about 51% received all four months of treatment.52 These results rely on the assumption that CHWs and caregivers accurately record SMC doses on SMC cards and/or that caregivers accurately report whether their children received and took SMC, which could lead to results over- or underestimating actual coverage. A study of malaria incidence before and during its SMC program in Northern Nigeria. A case-control study to measure how the protective effect of SMC in scale-up contexts compares with that found in randomized controlled trials. A baseline assessment of the prevalence of genetic markers for resistance to SMC drugs among malaria parasites, with a follow-up expected to take place in 2017. Results from following up with a cohort of 10,000 SMC recipients to track the rate of adverse events. SMC appears to have strong evidence of effectiveness. Seven randomized controlled trials provide strong evidence that SMC substantially reduces cases of malaria. More details are available at our intervention report on SMC. More information on our estimates of malaria burden in the countries where Malaria Consortium is working is available in our cost-effectiveness analysis. "Administrative" coverage: These coverage estimates are generated by collecting information from CHWs’ records about how many treatments they directly observed.57 Malaria Consortium provided a summary of the process for collecting and verifying this information, which we have included in the following footnote.58 We have not yet tried to assess this process. Coverage surveys: Data collectors visit a random sample of households in the target region, ask to review eligible children's caregivers' SMC record cards, and ask a variety of other questions to understand the quality of the program and the likely coverage of SMC. More details below. In some countries, large temporary migrant populations move into SMC treatment areas during the rainy season (such as nomadic tribes, or settled populations migrating for seasonal agricultural work or animal husbandry61) and then leave before they would be interviewed by coverage surveys. CHWs may be treating some people who live outside of the target coverage areas. There could be errors either in the number of treatments reported (the numerator) or in the assumed target population (the denominator). Below, we focus on analyzing Malaria Consortium's coverage surveys because we believe that coverage surveys are more likely to be accurate. For reference, all of the results from the administrative coverage estimates that we had seen by late 2016 are in the following footnote;64 Malaria Consortium shared additional data with us in 2017 from 2016 and 2017 programs, which we have not reviewed in detail. It appears that according to administrative coverage estimates, ACCESS-SMC’s overall coverage rate of its target population was about 91% in 2015.65 We have not vetted this estimate. "Do you know how many days should the child be given the drugs?" "What type of drug was given out?" "Do you know the recommended method to crush the tablets?" "In your opinion, how many children under five in this community have taken the medicine that prevents malaria during the rainy season?" "Did (NAME) take / swallow the drugs on day 2 and day 3 at home?" We have seen headline coverage survey results from all seven ACCESS-SMC countries for 2015 and 2016. A weighted average of these surveys finds that about 91% of children received at least one month of SMC treatment, about 69% received three months of treatment, and about 51% received all four months of treatment. We have also seen some early results from 2017 for Burkina Faso (first two cycles), Nigeria (first cycle), and Chad (first cycle). Results are summarized in this spreadsheet, sheet "Coverage." The fact that surveys identified relatively low coverage in some cases increases our confidence in their reliability. We have not carefully reviewed the methodology of Malaria Consortium's surveys in northern Nigeria, but they appear to be broadly similar to its ACCESS-SMC surveys, primarily relying on information from SMC cards and asking caregivers to recall the number of treatments given if the card is not available.87 It conducted its survey in a random sample of about 750 households in two of the four LGAs where it delivered SMC in northern Nigeria in 2014.88 This survey appears to have been done by Malaria Consortium (not LSHTM, which did the ACCESS-SMC surveys). We have seen three types of analyses of the impact of Malaria Consortium's northern Nigeria program on malaria indicators. These results seem to be consistent with the impacts of SMC found in randomized controlled trials of the program, but due to our remaining questions about the studies we do not yet see them as strong additional evidence for the impact of SMC programs. See our previous review of Malaria Consortium for more details on this study. 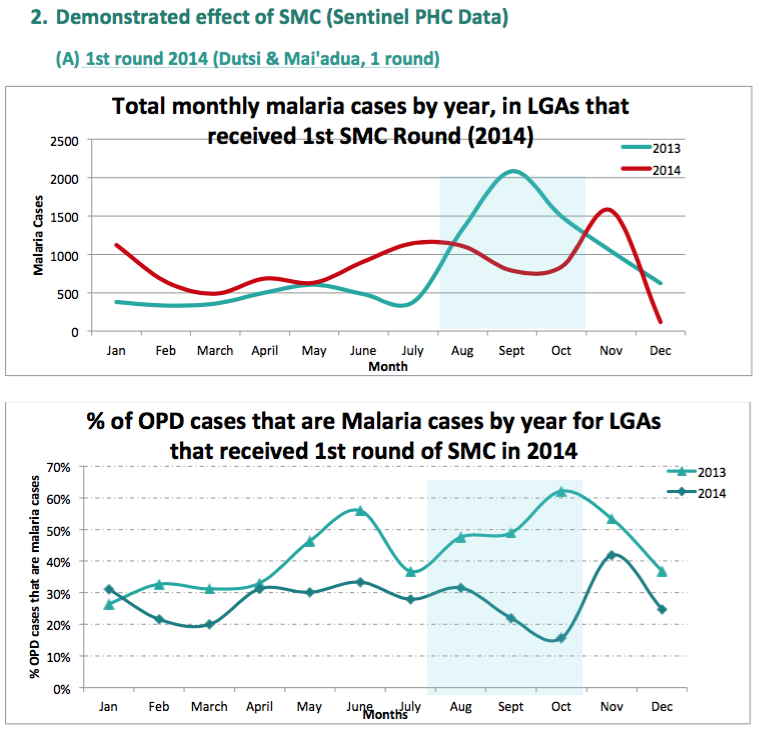 Possible "rebound" effects: There is a potential concern that SMC could reduce the natural development of immunity to malaria so that after children turn five years old, and are no longer eligible to receive SMC, or if SMC programs are interrupted by lack of funding or other problems, they could lack immunity and be more susceptible to malaria. We have not yet investigated this concern in-depth. Malaria Consortium notes that it will attempt to monitor malaria rebound in older children through sentinel site studies, if it receives the funding to do so;98 we have not yet seen sentinel site data. Side effects of SMC drugs: Our impression is that the most common reaction seen with SMC drugs in earlier programs was vomiting (AQ is bitter and hard to swallow if not crushed into a powder and mixed with water); more recently, AQ has been available as an orange-flavored dispersible.99 We do not have a strong sense of how common this is, though Malaria Consortium notes that it is no longer a common problem.100 Also, children are supposed to take the SMC drugs again within 30 minutes if they expel the drugs; we are unsure whether caregivers typically request extra drugs from CHWs when this happens to ensure their child gets a full treatment regimen. Our impression is that other side effects from these drugs are rare and include diarrhea, itching, headache, mild abdominal pain, and rash.101 A study in Nigeria that followed up with 10,000 SMC recipients one week after receiving SMC to ask about adverse events resulted in only five reports of adverse events, though Malaria Consortium believes there may have been reluctance to report issues.102 Malaria Consortium shared three resources that report very low severe adverse event rates from SMC drugs (available in the following footnote).103 We have not yet reviewed these. Drug quality and dosage: Malaria Consortium told us that it is only permitted to procure products from suppliers that meet WHO guidelines for pre-qualification quality assurance standards.104 We have not yet asked Malaria Consortium for the details of this process. If there were issues with drug quality or dosage, it could reduce the effectiveness of the intervention and lead to more rapid development of drug resistance. In order to make program costs comparable across all of our top charities, we aim to estimate the total cost to all actors of supporting a given program. Our estimate of cost-per-treatment for SMC includes research costs, start-up costs, and costs incurred by actors such as governments. Our estimates also rely on coverage survey estimates to approximate the number of people reached rather than administrative coverage estimates. With these assumptions, we estimate that the total cost to achieve the equivalent of four person-months of SMC coverage is about &dollar;6.80. Full details in this spreadsheet. SMC programs appear to be in the range of cost-effectiveness of our other priority programs. See our most recent cost-effectiveness model for estimates of the cost per life saved through Malaria Consortium-supported SMC programs and how our model compares this outcome with outcomes of other programs. We believe that Malaria Consortium could productively use more funding than it expects to receive to scale up its SMC activities. December 2017 update: In November 2017, we recommended that Good Ventures give &dollar;27.9 million to Malaria Consortium. After accounting for this grant, we expect that Malaria Consortium will continue to have a funding gap for 2018-2020 on the order of tens of millions of dollars. ACCESS-SMC, funded by Unitaid and the primary source of Malaria Consortium's SMC funding in 2015-2017, is ending in February 2018 and will not cover any treatments in 2018. The grant was originally set to cover SMC treatments in 2015 and 2016 and was extended to continuing supporting treatments in some countries in 2017.106 Malaria Consortium told us that funding from Unitaid will not be renewed because part of its strategy is to provide catalytic funding for relatively new programs (such as SMC) to prove that they work at a large scale, with the goal of having other large funders (and/or domestic resources) fill the gaps for those programs in the future.107 We have not yet spoken with Unitaid about its thinking. Malaria Consortium's estimate of a &dollar;28-30 million per year funding gap for SMC makes certain assumptions about what funding will be available from the US government's President's Malaria Initiative (PMI), the World Bank, and the Global Fund. These major funders have indicated they will fund SMC (or in the case of the Global Fund, countries have indicated in what areas they will use funding from the Global Fund to fund SMC). The total funding gap for SMC could be larger or smaller if these major funders change their plans. More detail in this spreadsheet, see the sheet "Available and expected funding." Malaria Consortium estimates it could spend &dollar;28-30 million per year in the next three years to deliver SMC. More detail in this spreadsheet, see the sheet "spending opportunities." Malaria Consortium, through the ACCESS-SMC program, has demonstrated that it has the capacity to manage a large-scale program with reasonably high-quality monitoring. With the exception of Guinea-Bissau, it has previously implemented SMC in the countries it is seeking funding for. We would guess that funding, rather than other bottlenecks, will be the limiting factor on how much of the global funding gap for SMC Malaria Consortium can fill. Note that for our room for more funding analysis we ask top charities for rough estimates of their ideal budgets for the next two to three years. GiveWell-directed funding can fluctuate a lot year to year and so our preference is for the organizations we direct funding to to treat the funding as a multi-year grant to help smooth funding year-to-year and allow for longer-term planning. We believe it is highly unlikely that Malaria Consortium will receive more than &dollar;86 million for SMC, but if it did, we expect it would use the funds to fill any unanticipated gaps and to fund the program into 2021 and beyond. Timeline of distributions: Malaria Consortium told us that it generally needs about 6-7 months to plan a SMC distribution after it has received official confirmation of funding for the distribution.116 In December 2016, we told Malaria Consortium that we were recommending that Good Ventures make a &dollar;5 million grant for the SMC program and Malaria Consortium received these funds in February 2017. It used a portion of this funding to purchase drugs and deliver treatments in the 2017 rainy season (roughly June to September).117 This may not be indicative of the timeline that would be needed for delivering a larger number of treatments. ACCESS-SMC estimated that in the seven countries in which it was working in 2016, about 54% of eligible children would not be reached and the total cost of filling the unmet need for 2016 was approximately &dollar;49 million.123 We have not vetted this estimate. As of August 2017, it was Malaria Consortium's understanding that minimal funding gaps for SMC in SMC-eligible districts were expected in the next couple of years in Cameroon, Ghana, Guinea, Mali, The Gambia, Togo, and, less certainly, in Niger.124 It believed that funding gaps remained for Nigeria, Burkina Faso, Chad, and Guinea-Bissau (see above). In November 2017 we asked Melanie Renshaw of ALMA for updates on the size of the funding gap. Dr. Renshaw shared preliminary data from Roll Back Malaria Partnership (RBM) on the size of funding gaps for SMC commodities in eligible countries (data for four countries, the Gambia, Mali, Mauritania, and Senegal were not yet available). RBM's country estimates indicated that there are funding gaps in each 2018, 2019, and 2020 in Chad and Nigeria, and a gap in Burkina Faso in 2020 but not in 2018 or 2019.130 We do not know why this estimate differs from Malaria Consortium's estimate. We added Malaria Consortium to our list of top charities in 2016. We have spent less time investigating Malaria Consortium and have less insight into its activities and track record than we do for top charities which we have followed for many years. Track record: Malaria Consortium has experience with supporting large-scale SMC programs, particularly through its work on ACCESS-SMC. It has not yet produced all of the types of monitoring and research that it has said it will for ACCESS-SMC. Self-evaluation: Malaria Consortium's self-evaluation is strong compared to the vast majority of organizations we have considered. Communication: To date, Malaria Consortium has generally communicated clearly with us. Transparency: Malaria Consortium is transparent. It has allowed us to publish most of the information it has shared with us. We had one conversation with Malaria Consortium staff in each of January, February, and March, 2016. GiveWell's non-verbatim summary of a conversation with Malaria Consortium Staff, August 25, 2016. GiveWell's non-verbatim summary of conversations with Malaria Consortium staff, November 7 and November 9, 2016. GiveWell's non-verbatim summary of a conversation with Malaria Consortium Staff, November 23, 2016. GiveWell's non-verbatim summary of a conversation with Malaria Consortium staff, January 18, 2017. GiveWell's non-verbatim summary of a conversation with Malaria Consortium staff, January 19, 2017. GiveWell's non-verbatim summary of a conversation with Malaria Consortium staff, March 24, 2017. GiveWell's non-verbatim summary of a conversation with Diego Moroso, April 25, 2017. We have had some additional conversations with Malaria Consortium for which we did not produce conversation notes. "Established in 2003, Malaria Consortium is one of the world’s leading non-profit organisations specialising in the prevention, control and treatment of malaria and other communicable diseases among vulnerable populations. Our mission is to improve lives in Africa and Asia through sustainable, evidence-based programmes that combat targeted diseases and promote child and maternal health." Malaria Consortium website, "Who We Are". ...With 95 percent of our staff working in malaria endemic areas, we currently have programmes and projects in 12 countries across Africa and Southeast Asia. Our local insight, embedded technical expertise and practical skills give us the agility to respond to critical challenges quickly and effectively." Malaria Consortium website, "Who We Are". Malaria Consortium spent about 50,840,000 British pounds from April 1, 2016 to March 31, 2017. See Malaria Consortium, Trustees' report and financial statements 2017, "Total expenditure" "for the year ended 31 March 2017", Pg 17. We used X-RATES to find the USD to GBP as of March 31, 2017: 1.253. Percentage of spending coming from restricted funds calculation: 44,940,000 British pounds / 50,840,000 British pounds = 0.88. See "Total expenditure" from 2016) and compare "Restricted funds" and "Total funds" columns on Pg 16. See also Malaria Consortium, restricted and unrestricted expenditure analysis 2016. "In March 2012, the World Health Organisation (WHO) issued a policy recommendation for a new intervention against Plasmodium falciparum malaria - seasonal malaria chemoprevention (SMC), previously referred to as intermittent preventive treatment in children (IPTc), in children under five years old. SMC is defined as the intermittent administration of full treatment courses of an anti-malarial treatment combination during the malaria season to prevent illness and death from the disease. The objective is to maintain therapeutic anti-malarial drug concentrations in the blood throughout the period of greatest risk. This will reduce the incidence of both simple and severe malaria disease and the associated anaemia and result in healthier, stronger children able to develop and grow without the interruption of disease episodes. SMC has been shown to be effective, cost effective and feasible for the prevention of malaria among children in areas where the malaria transmission season is no longer than four months." Malaria Consortium website, "Seasonal Malaria Chemoprevention". World Health Organization, "Seasonal Malaria Chemoprevention". World Health Organization, "Seasonal Malaria Chemoprevention: A Field Guide", Pg 7. World Health Organization, "Seasonal Malaria Chemoprevention: A Field Guide", Pg 8. World Health Organization, "Seasonal Malaria Chemoprevention: A Field Guide", Pg 9. Malaria Consortium provided the edit to the quotation in response to a draft of this page in October 2017. Local announcements each month will inform the community about the date of SMC, which will be delivered by community health workers at pre-arranged locations in the community, or by visiting each household. Health workers will receive appropriate training before the intervention begins and will be supervised by nurses and the district health team. "ACCESS-SMC project brochure, Pg 3. Malaria Consortium noted that health workers are also sometimes trained for SMC programs (comment provided in response to a draft of this page in October 2017). For Malaria Consortium's SMC program in Nigeria: "House to house delivery method was the most used approach, as reported by 88.2 percent of the respondents. This was similar across the LGAs [local government areas] though Maiadua had slightly higher numbers receiving through the fixed point delivery approach. The duration spent in receipt of drugs in the home was 20 minutes, half the time spent in receipt of drugs from a fixed point which was 47 minutes. Knowledge of the different types of SMC drugs and dose duration was high at over 80 percent. This highlights house to house delivery of SMC as a quicker and most preferred delivery mechanism by the caregivers. There is need for costing the two delivery mechanisms to assess if home based delivery still remains a cost effective delivery channel." Malaria Consortium, Nigeria SMC evaluation report, 2014, Pg 38. For ACCESS-SMC delivery methods, see the annexes on Pgs 31-70 of ACCESS-SMC multi-country cost analysis, January 2017. Sample quote: "A combination of 6,500 trained community distributors and 355 health facility staff (e.g. nurses and midwives) administered SMC by way of two distribution methods: door-to-door (two-person teams) and at fixed points located at health centers (one-person teams) which were in place to serve primarily as referral centers for sick children and provide SMC to children who were came to the facility. It was estimated that 90% of SMC was distributed by door-to-door teams and 10% was distributed at fixed points. To ensure the acceptability of SMC and high rates of coverage within communities, 3,483 trained community mobilizers sensitized communities on the benefits of SMC prior to and during each distribution cycle." ACCESS-SMC multi-country cost analysis, January 2017, Pg 31. In response to this review, Malaria Consortium noted that “In most cases this is true. However, due to the number of CDDs/CHWs required to implement SMC we have had to recruit and train other community volunteers who only provide SMC services.” Malaria Consortium emails (unpublished), November 23, 2016. Comments from Malaria Consortium in response to a draft of this page in October 2017. Malaria Consortium emails (unpublished), November 23, 2016. Note from Malaria Consortium provided in response to a draft of this page in October 2017. See Figure 1, Pg 8, Malaria Consortium, "Seasonal Malaria Chemoprevention Programme Start-Up Guide, Nigeria"
See Figure 1, Pg 8, Malaria Consortium, "Seasonal Malaria Chemoprevention Programme Start-Up Guide, Nigeria". "DOT" stands for "Directly Observed Treatment". "How long should the Role Model Caregiver observe each child after giving SMC medicines? a) 10 minutes, b) 15 minutes, c) 30 minutes, d) 1 hour, [Correct answer: C]" Malaria Consortium Quiz Answer Key. "What should the Role Model Caregiver advise the child’s caregiver after giving the first dose of the SMC medicines? a) When to take the second and third dose of Amodiaquine (AQ) at home, b) The importance of adherence to giving the two doses of Amodiaquine (AQ) home, c) What to do if the child vomits, d) How to mark the SMC Record Card after giving each dose and to bring the card back for the next SMC cycle, e) When to go to the health facility if the child gets a fever or very sick, f) All of above, [Correct Answer: F.]" Malaria Consortium Quiz Answer Key. "The child’s SMC Record Card is very important because: a) It shows the Role Model Caregiver the name and register number of the child, b) The child’s caregiver should always take it with them if they need to go to the health facility, c) It shows how many times the child received the SMC medicines each month, d) It is made of thick paper and is in a plastic packet, e) a, b and c, f) All of the above, [Correct answer: E.]" Malaria Consortium Quiz Answer Key. We have seen a few versions of templates for "SMC Record Cards." The latest version that we have seen (from 2016) is here: SMC Record Card Template 2016. Malaria Consortium told us that caregivers are able to visit CHWs to request additional treatments if their child vomits. GiveWell's non-verbatim summary of conversations with Malaria Consortium staff, November 7 and November 9, 2016. See Figure 1, Pg 8, Malaria Consortium, "Seasonal Malaria Chemoprevention Programme Start-Up Guide, Nigeria". "Who should NOT get SMC medicines? a) Any child with a fever or who is severely ill, b) Any child who is currently taking a sulfa medication such as co-trimoxazole (Septrin, or Bactrim), c) A child who has received a dose of either Amodiaquine (AQ) and sulfadoxine / pyrimethamine (SP) during the past month, d) A child who is allergic to sulfa medication such as co-trimoxazole, Septrin, or Bactrim, e) A child who is allergic to either Amodiaquine (AQ) and sulfadoxine / pyrimethamine (SP), f) a,b,ande, g) All of the above. [Correct answer is G.]" Malaria Consortium Quiz Answer Key. "What important questions must the Role Model Caregiver ask about each child before giving SMC medicines? a) The child’s age, b) If the child has taken any medicines in the past 28 days, and which ones, c) If the child has any allergies, d) If the child has a fever or is sick, e) a, b, and d, f) All of the above, [Correct answer is F.]" Malaria Consortium Quiz Answer Key. "What should the Role Model Caregiver do if a child has a fever on the day SMC medicines are being given? a) Complete the SMC Referral Form, b) Refer the child to the nearest health facility for a malaria test, c) Complete the SMC Register with the reason for the referral, d) Give the child Coartem, e) Give the child the SMC medicines to treat the fever, f) a, b, and c, g) All of the above, [Correct answer is F.]" Malaria Consortium Quiz Answer Key. "SMC medicines come in two colour packets for different age children. What age group should get the medicines in the YELLOW packets? ... [correct answer:] b) 3 to 12 months " Malaria Consortium Quiz Answer Key. "SMC medicines come in two colour packets for different age children. What age group should get the medicines in the BLUE packets? ... [correct answer:] b) 12 to 59 months" Malaria Consortium Quiz Answer Key. 1. Ask the caregiver how old the child is. 2. Ask to see the child’s vaccination card. 3. If the caregiver does not know the child’s age or does not have a vaccination card; ask the caregiver to describe the events when the child was born. (Dry or rainy season, religious celebrations such as Eid or Ramadan, political, or social events). – Hop on one foot"
There is in general a “proximity supervisory team” (CHWs with higher education or literacy skills / experience or a junior health worker) who follow a number of distribution teams (for instance, in Burkina Faso it’s 1 for every 5 CHW teams, in Nigeria, 1 for every 3 community drug distributor (CDD) teams). They work 3 to 4 days per cycle. Health workers from one health facility carry out spot-check corrective supervision over all CDDs/CHWs and all supervisors in their catchment area; they work 3 to 4 days per cycle. District health officials carry out supervisory visits over both distributors (to check quality of administration) and supervisors (to check on the quality / frequency of supervision). They work 3 to 4 days per cycle. Regional health officials carry supervisory spot-check visits over all the levels below, to check on the quality of administration and of supervision and provide corrective guidance. They work 2 to 4 days per cycle. National Malaria Control Program (NMCP) supervisors carry out supervisory spot-check visits over all the levels below (as above). They work 3 to 4 days per cycle. Malaria Consortium and partner’s country supervisors / teams carry out spot-check visits (independently or jointly with health authorities, as above). They work 4 days per cycle on supervision and implementation monitoring. AfRO Malaria Consortium and partner staff carry out regular country field visits including spot-check supervision to control all of the above. About 2 visits per country during the SMC round at minimum. The system is quite extensive and well-rehearsed, since it is used across several child survival, mass prevention campaigns. While it is likely that there will be some mistakes at this scale (in particular, age misclassification and eligibility are common issues for all mass campaigns, with no easy, inexpensive solutions around it), major mistakes in administration are likely to be caught. While these have not been quantified, in nearly 10,000 estimated instances of spot-check supervision across the region, anecdotal instances of reported gross negligence in administration of drugs, that could be identified in 2015, were within the hundreds, and promptly corrected: these mostly related to lack of observation of hygiene practices, excessive use of water, ignoring directly observed therapy (DOT) protocols, severe age misclassification, non-respect of observation time, and premature administration of second DOT after vomiting. Most of the other problems identified were, instead, around appropriate administration record-keeping, due to low literacy levels of volunteers in many countries. Please mind that no other mass campaign outside operational research is known to keep detailed individual records of recipients. In most mass campaigns that are known to be safe and effective (measles, polio, pneumonia, vitamin A, deworming, NTD MDAs, just to name a few), only simple tally sheets and sample in-process monitoring are used. Due to the research needs of a new intervention, SMC is being held to extremely high accountability standards as compared to other interventions. It is unlikely that individualized records and these layered levels of supervision are sustainable in the long term and/or at an increased scope, because of the implication on resources needed and costs to local budgets." Malaria Consortium emails (unpublished), November 23, 2016. "Budget: 1,694,339.00 (USD)" Malaria Consortium, "Support Scale up of Seasonal Malaria Chemoprevention (SMC)". We also searched the Gates Foundation's grant database to see whether it made any additional grants to Malaria Consortium for SMC work, but only saw this grant (grant page available at Gates Foundation, "Malaria Consortium"). "Malaria Consortium is implementing and assessing the feasibility of a community-based seasonal malaria chemoprevention (SMC) project in Katsina state, northern Nigeria, with funding from the Bill & Melinda Gates Foundation. Following new World Health Organisation policy recommendations on SMC, this project administers full antimalarial treatments during the malaria season in areas with highly seasonal malaria transmission, to prevent illness among children under five." Malaria Consortium, Project Brief: Seasonal malaria chemoprevention, Katsina, Pg 1. To inform future national and state plans for SMC continuation/ scale up by disseminating findings and sharing experiences with key stakeholders" Malaria Consortium, Project Brief: Seasonal malaria chemoprevention, Katsina, Pg 2. It appears that this project may have also been related to another major (£89 million) project that Malaria Consortium was working on in Nigeria called "Support to National Malaria Programme (SuNMaP)". "Support to National Malaria Programme (SuNMaP) is an £89 million UK aid funded project that works with the government and people of Nigeria to strengthen the national effort to control malaria. The programme began in April 2008 and [ended] in March 2016. Led by Malaria Consortium, SuNMaP was jointly managed by a consortium, including lead partners Health Partners International and GRID Consulting, with nine other implementing partners. SuNMaP was implemented in 10 states across Nigeria, including Anambra, Kano, Niger, Katsina, Ogun, Lagos, Jigawa, Enugu, Kaduna and Yobe. SuNMaP worked with the Nigerian government's National Malaria Elimination Programme (NMEP) to harmonise donor efforts and funding agencies around national policies and plans for malaria control. Project targets were aligned with the National Malaria Strategic Plan and Global Malaria Action Plan. The project aimed to improve national, state and local government level capacity for the prevention and treatment of malaria." Malaria Consortium, SuNMaP Final Report, Pg 38. "July 2013: Result of SuNMaP study on efficacy of sulphadoxine‐pyrimethamine (SP) for intermittent treatment against malaria in pregnancy published. SuNMaP commences seasonal malaria chemoprevention in Katsina State." Malaria Consortium, SuNMaP Final Report, Pg 16. "Length of project: 2012-2014 (33 months)," Malaria Consortium, Project Brief: Seasonal malaria chemoprevention, Katsina, Pg 1. "[In 2013], Total number of children covered = 487,354"; "[In 2014], Total number of children covered = 1,112,330," Cost analysis of the seasonal malaria chemoprevention project in Katsina state, Nigeria, Pg 20. However, compare to "A total of 487,353 treatment courses were delivered in two LGAs over three treatment cycles in the first round of SMC representing an average of 115% coverage over the three cycles. In 2014, a total of 1,078,440 treatments were provided across four LGAs over four cycles with an average of 115% administrative coverage." Malaria Consortium, Monitoring and evaluation summary Nigeria, Pg 2. Our understanding is that about 4 treatments were aimed to be delivered per child, suggesting that about 350,000 to 400,000 children were targeted. (487,354 + 1,112,330) / 4 = 399,921, while (487,353 + 1,078,440) / 4 = 391,448.25. "The project also has a number of critical milestones:...85 percent of children targeted receive all courses of SMC in the second round," Malaria Consortium, Project Brief: Seasonal malaria chemoprevention, Katsina, Pg 2. [Under "Process of implementation 2"]: "Selection and training of 2,500 community caregivers (CHWs) and supervisors to deliver the intervention and complete the necessary forms," Slide 13, Malaria Consortium, SMC presentation, May 6, 2014. Note: Malaria Consortium gave us an updated figure of 3,600 CHWs, which is cited above. Full implementation in four LGAs in 2014," Slide 9, Malaria Consortium, SMC presentation, May 6, 2014. "The project’s objectives are: ...To inform future national and state plans for SMC continuation/scale up by disseminating findings and sharing experiences with key stakeholders," Malaria Consortium, Project Brief: Seasonal malaria chemoprevention, Katsina, Pg 1. "Background: Experience of seasonal malaria chemoprevention (SMC) is growing in the Sahel sub-region of Africa, though there remains insufficient evidence to recommend a standard deployment strategy. In 2012, a project was initiated in Katsina state, northern Nigeria, to design an appropriate and effective community-based delivery approach for SMC, in consultation with local stakeholders. Formative research (FR) was conducted locally to explore the potential feasibility and acceptability of SMC and to highlight information gaps and practical considerations to inform the intervention design. Methods: The FR adopted qualitative methods; 36 in-depth interviews and 18 focus group discussions were conducted across 13 target groups active across the health system and within the community. Analysis followed the ‘framework’ approach. The process for incorporating the FR results into the project design was iterative which was initiated by a week-long ‘intervention design’ workshop with relevant stakeholders. Results: The FR highlighted both supportive and hindering factors to be considered in the intervention design. Malaria control was identified as a community priority, the community health workers were a trusted resource and the local leadership exerted strong influence over household decisions. However, there were perceived challenges with quality of care at both community and health facility levels, referral linkage and supportive supervision were weak, literacy levels lower than anticipated and there was the potential for suspicion of ‘outside’ interventions. There was broad consensus across target groups that community-based SMC drug delivery would better enable a high coverage of beneficiaries and potentially garner wider community support. A mixed approach was recommended, including both community fixed-point and household-to-household SMC delivery. The FR findings were used to inform the overall distribution strategy, mechanisms for integration into the health system, capacity building and training approaches, supportive interventions to strengthen the health system, and the social mobilization strategy. Conclusions: Formative research played a valuable role in exploring local socio-cultural contexts and health system realities. Both opportunities and challenges for the introduction of SMC delivery were highlighted, which were appropriately considered in the design of the project." "UNITAID has awarded up to &dollar;67 million to Malaria Consortium to oversee the largest-yet global programme to increase seasonal malaria chemoprevention (SMC) across the Sahel region of Africa, where malaria remains the leading cause of severe illness and mortality in young children...This grant will help increase capacity and reduce prices for SMC products in the seven target countries and is expected to supply an estimated 30 million treatments every year to protect 7.5 million children, preventing around 50,000 deaths." Malaria Consortium, ACCESS-SMC announcement, May 8, 2014. "ACCESS-SMC is a UNITAID-funded project, led by Malaria Consortium in partnership with Catholic Relief Services, which is scaling up access to seasonal malaria chemoprevention (SMC) across the Sahel to save children’s lives. This three year project is supported by London School of Hygiene & Tropical Medicine, Centre de Support de Santé International, Management Sciences for Health, Medicines for Malaria Venture, and Speak Up Africa. It will provide up to 30 million SMC treatments annually to 10 million children less than five years of age [specifically, children ages 3 to 59 months] in Burkina Faso, Chad, Guinea, Mali, Niger, Nigeria and The Gambia, potentially averting 49,000 deaths due to malaria." Malaria Consortium, ACCESS-SMC page. "ACCESS-SMC is working with all seven supported National Malaria Control Programs (NMCPs) to create SMC delivery pathways. We are providing support in a range of areas, including planning and management, supply chain, health worker training and communications and social mobilization. The project is also procuring almost 15m doses of SMC drugs in 2015, and up to 30m in 2016. Working together with NMCPs, we will reach 3.3m children in 2015 and up to 6.6m children by 2016 in Burkina Faso, Chad, Guinea, Mali, Niger, Nigeria and The Gambia." ACCESS-SMC website, "The Project". Clarifications around number of children targeted annually from Malaria Consortium emails (unpublished), November 23, 2016. "UNITAID has awarded up to &dollar;67 million to Malaria Consortium to oversee the largest-yet global programme to increase seasonal malaria chemoprevention (SMC) across the Sahel region of Africa, where malaria remains the leading cause of severe illness and mortality in young children." Malaria Consortium, ACCESS-SMC announcement, May 8, 2014. "Malaria Consortium’s three year project, known as ACCESS SMC, will run across seven African countries: Burkina Faso, Chad, Guinea Conakry, Mali, Niger, Nigeria and The Gambia. ACCESS-SMC will be led by Malaria Consortium, with Catholic Relief Services as the primary sub-grantee. It will be supported by London School of Hygiene & Tropical Medicine, Management Sciences for Health, Medicines for Malaria Venture, Speak Up Africa and Centre de Support en Sante International." Malaria Consortium, ACCESS-SMC announcement, May 8, 2014. Malaria Consortium is leading the ACCESS-SMC project, tracking its impact, managing the procurement of SMC drugs and supporting malaria control programmes to implement SMC in Burkina Faso, Chad and Nigeria. impact of the project and supporting malaria control programmes to implement SMC in Guinea, Mali, Niger and The Gambia. London School of Hygiene & Tropical Medicine is generating evidence on drug resistance, strengthening pharmacovigilance and measuring SMC’s public health impact. Medicines for Malaria Ventures is supporting manufacturers to develop a child friendly, dispersible formulation and ensuring accurate drug forecasting. Management Sciences for Health is measuring the cost of SMC and working with countries to optimize the SMC supply chain. Speak Up Africa is creating an integrated health communications and advocacy campaign. The complementary nature of the partnership, which includes non-profit and academic institutions, allows substantial geographic reach and ensures that good evidence will guide future SMC implementation." ACCESS-SMC fact sheet, Pg 2. Catholic Relief Services is the lead-subrecipient and contributing to tracking the reach and impact of the project and supporting malaria control programmes to implement SMC in Guinea, Mali, Niger and The Gambia." ACCESS-SMC fact sheet, Pg 2. See Table 7, ACCESS-SMC multi-country cost analysis, January 2017, Pg 19. See "Costs" sheet, GiveWell SMC cost per treatment estimate, November 2017. "Overall, the comprehensive SMC implementation support in what we call internally “GiveWell Districts” will target approximately 650,000 children, at an approximate cost estimated at 2.5M USD for 2017 (with some carryover costs in 2018 for operational close-out, data analysis and reporting)." Pg. 4. Nigeria: "Since 2013, Nigeria was supported first by Bill & Melinda Gates Foundation and then through other one-off funding to implement SMC in six Local Government Areas (LGAs) in the States of Katsina and Jigawa. Through the funding provided by GiveWell / Good Ventures, Malaria Consortium reinstated support to these 6 LGAs that did not have any confirmed funding in 2017." Pg. 2. Burkina Faso: "Thanks to large amount of drugs left over from various partners’ activities in 2016, Burkina Faso had drugs enough to cover approximately 360,000 extra children, but no operational costs to do so. Thus, Malaria Consortium through GiveWell / Good Ventures funding has started supporting three districts that had benefited from SMC in previous years, but which had no secured support for 2017, as well as five more new priority districts for SMC." Pg. 2. Guinea Bissau: "The original plan was to support two regions for a total of 80,000 children, and approximately 400,000 dispersible SP+AQ blisters were directed to Guinea Bissau. However, eventually the MoH managed to secure funding for half of this target (one region) through the UNDP, and as a consequence the support in Guinea Bissau will be limited to the region of Gabu in the East of the country, targeting approximately 40,000 children under 5. The drugs that will be left over from the current order will have expiration date beyond 2019, so they will be available for use for a new round in 2018." Pg 3. [Under "Scale up – plans and possibilities":] "In Nigeria in 2014 (9.2 million children) Malaria Consortium will target 500,000 children in Katsina and Jigawa state (CHAI will also implement in Kano state if funding can be obtained)," Slide 22, Malaria Consortium, SMC presentation, May 6, 2014. "Malaria Consortium has already started working with the Ministry of Health to roll out SMC in Katsina through its management of SuNMaP (the DFID-funded Support for the National Malaria Programme) and with support from the Bill & Melinda Gates Foundation. SuNMaP will also support the roll out of SMC across Jigawa state and Malaria Consortium has plans to extend the activity to additional states in due course." Malaria Consortium website, "Seasonal Malaria Chemoprevention". Malaria Consortium's budget for GiveWell-directed funds includes &dollar;0.51 million for monitoring support in ACCESS-SMC areas, &dollar;0.48 million for coverage evaluation and &dollar;0.3 million for LSHTM TA Word on coverage surveys, for a total of &dollar;1.29 million. Discussion of activities in Summary update - GiveWell/Good Ventures funding for SMC. Malaria Consortium's budget for GiveWell-directed funds includes &dollar;100,000 for data management overhaul (described in Summary update - GiveWell/Good Ventures funding for SMC), &dollar;50,000 for global coordination cost, and &dollar;437,000 (10%) for overheads, for a total of &dollar;587,000 (Malaria Consortium, Financial summary, September 2017). Cost analysis of the seasonal malaria chemoprevention project in Katsina state, Nigeria. For example, see Tables 4 and 5, Pgs 20-21. Diego Moroso, Project Director for ACCESS-SMC at Malaria Consortium, email to GiveWell, August 14, 2017. Some additional details on this activity: "All drugs procurement is centralized at our Kampala office for all countries. We require countries to carry out a revised quantification every year based on consumptions and stocks from previous years, consolidate orders, recruit procurement agent, negotiate pricing points with Guilin (and in the future, more pharma companies we hope), we monitor production and shipment schedules and make sure country teams are aware of when drugs come / delays, etc. Countries are responsible for providing us with all the relevant import requirements to make sure that all documentation is ready when drugs arrive. They then work out with local clearing agents the custom procedures, tax waivers, etc, and proceed with whatever logistics options / approaches are relevant in their countries (from direct delivery to peripheral health units as in Nigeria, to mixed approaches involving MoH storage and MC / CRS transport, to full contracting with MoH-mandated central pharmacy – depends on context)." Diego Moroso, Project Director for ACCESS-SMC at Malaria Consortium, email to GiveWell, August 14, 2017. Some additional details on this activity: "Malaria Consortium developed all original training material for ACCESS-SMC [...] We could say that now the materials are pretty settled, with only minor changes / improvement happening yearly or less, based on experience from the field. We co-organize central trainings with [National Malaria Control Programs], and we then support and oversee cascade trainings (always in joint MC/NMCP teams – CRS teams in former CRS countries under ACCESS-SMC)." Diego Moroso, Regional Project Director for ACCESS-SMC at Malaria Consortium, email to GiveWell, August 14, 2017. See this spreadsheet, sheet "Coverage." "Malaria is still a serious public health concern in Nigeria, with fevers presumed to be malaria accounting for 60 percent of outpatient visits to health facilities, 30 percent of childhood deaths, 25 percent of deaths in children under one year and 11 percent of maternal deaths. In northern Nigeria, where malaria transmission is highly seasonal, malaria prevalence is also comparatively higher than other areas during the rainy seasons. The implementation of SMC in Katsina is specifically intended to reduce mortality in children under five living in areas with seasonal malaria, and strengthen health systems at the state and national levels." Malaria Consortium, Project Brief: Seasonal malaria chemoprevention, Katsina, Pg 1. Also, Malaria Consortium told us that “eligible districts are established by the National Malaria Programmes in the countries applying the WHO rainy season seasonality rules.” Malaria Consortium emails (unpublished), November 23, 2016. Timothy Rubashembusya Trip Report from Burkina Faso, August 2016 includes a table that shows discrepancies in estimated coverage rates between "MC data" and "LSHTM survey". See Pg 4. Timothy Rubashembusya Trip Report from Burkina Faso, August 2016 writes: "Propose data quality assessments for 2015 distribution data: The background of this was due to major discrepancies of coverage rates arising between the LSHTM 2015 End of Cycle survey and the administrative data submitted. Whereas these are not expected to be exactly the same, there were some major discrepancies in Cycle 4 coverage rates arising from the LSHTM survey in relation to the data reported through our routine reports. Examining further the results from the LSHTM reports presents some questions about the numbers presented which will only be ascertained by further evaluation of where the problem arose from. For example, the LSHTM reports that the rate of children who received all the 4 cycles was 86.4%. This isn’t realistic as both Cycle 4 and Cycle 3 from the same survey showed rates less than 86.4% (ie. 68.4% and 82.0%, respectively). i.e. the number of those who received all the 4 cycles would need to be less or equal to the least cycle coverage rate to be valid – which is not the case. Recommendation: These discrepancies will be assessed further in relation to other countries to enable propose a clear strategy. However in the interim, I have proposed to plan a data verification exercise for 3 randomly selected districts out of the 11 which were part of the 2015 SMC distribution. This verification exercise would only focus on the fourth cycle – given that this is where we see a major gap. Out of these 3 districts, we would need to validate the records available at 3 (also randomly selected) CSPSes by comparing these records with those submitted in the MC reports. I will collaborate directly with Damiba Jean-Dieudonne to see how this can be achieved and in what timeframe." Timothy Rubashembusya Trip Report from Burkina Faso, August 2016, Pgs 4-5. "SMC coverage surveys: All eligible children in endemic areas are expected to receive SMC every month during the high transmission season. Although output level data will provide information on the number of children who received SMC during each distribution cycle, the real coverage at population level can only be measured through representative household surveys, similar to coverage assessment of the Expanded Programme of Immunization (EPI). Indeed, sampling households at community level will guarantee the inclusion of eligible children potentially missed by the distribution teams and the exclusion of outsiders to the targeted community." ACCESS-SMC M&E strategy, November 2015, Pg 8. We came to this understanding through comments from Malaria Consortium emails (unpublished), November 23, 2016. "Routine monitoring data included SMC distribution data, extracted from SMC registers and selected routine health facility Health Management Information System (HMIS) data obtained from selected sentinel sites. Routine SMC distribution data was extracted from community health workers (CHWs) at the end of each distribution cycle. This data was aggregated at settlement, ward and LGA levels and compared with the estimated eligible population totals to establish SMC coverage at each distribution cycle. SMC coverage, estimated from distribution data is highlighted in figure 1 below. A total of 487,353 treatment courses were delivered in two LGAs over three treatment cycles in the first round of SMC representing an average of 115% coverage over the three cycles. In 2014, a total of 1,078,440 treatments were provided across four LGAs over four cycles with an average of 115% administrative coverage." Malaria Consortium, Monitoring and evaluation summary Nigeria, Pg 2. "Table 1: Routine data and sources...Children reached…[Routine data source:] CHWs & HF [Health Facility] SMC drug registers" See Table 1, Malaria Consortium, M&E Plan Nigeria, Pg 10. We have seen a few versions of templates for registers that CHWs may use when distributing SMC drugs. The latest version that we have seen is here: ACCESS-SMC Register Template. Produce indicator performance statistics to aid project management and decision making regarding project implementation." Malaria Consortium, M&E Plan Nigeria, Pg 17. We have not yet seen reports from the above data management system. "Each CDD/CHW team fills – among other things – one tally sheet per day with one directly observed treatment per child successfully treated – among other information recorded, by age, and which they submit to their reference health facility (to the head nurse or doctor, as applicable). The health workers consolidate tally sheets each day, and transmit information by SMC or calls or other means to district. District data managers (or equivalent role) consolidate all tally sheet data from their facilities and submit for validation / consolidation to regions and NMCP / central administration. This is how data for any mass campaign are managed, with slight variations in roles, tools, layers of control / validation, quality assurance elements." Malaria Consortium emails (unpublished), November 23, 2016. It appears that about 62% of targeted children received at least 3 cycles of SMC in 2014 according to coverage surveys. See Table 5.3, Malaria Consortium, Nigeria SMC evaluation report, 2014, Pg 31. However, it appears that administrative coverage showed coverage estimates of over 100%: "A total of 487,353 treatment courses were delivered in two LGAs over three treatment cycles in the first round of SMC representing an average of 115% coverage over the three cycles. In 2014, a total of 1,078,440 treatments were provided across four LGAs over four cycles with an average of 115% administrative coverage." Malaria Consortium, Monitoring and evaluation summary Nigeria, Pg 2. The figure 62% refers to the proportion of targeted children receiving at least 3 cycles of treatment according to coverage, while 115% refers to the average administrative rate of coverage in each cycle of treatment. While these numbers are not directly analogous, we believe they demonstrate the discrepancy between these two types of coverage estimates. ACCESS-SMC: "Percent coverage (3-59 months) [who received four cycles]" versus "Percent of children (3-59 months) receiving four full cycles of SMC, based on LSHTM coverage survey" in Table 3, ACCESS-SMC multi-country cost analysis, January 2017, Pg 12. For estimates of how many children who were six to seven years old received at least one cycle of SMC in ACCESS-SMC countries in 2015 and 2016, see this spreadsheet, sheet "Coverage." The estimates suggest that, among children in this age group whose caregivers were interviewed, 56% (range across countries: 15%-81%) received at least one cycle of treatments. GiveWell's non-verbatim summary of a conversation with Malaria Consortium Staff, November 23, 2016. Early data from 2017 surveys in this spreadsheet, sheet "Coverage." "A total of 487,353 treatment courses were delivered in two LGAs over three treatment cycles in the first round of SMC representing an average of 115% coverage over the three cycles. In 2014, a total of 1,078,440 treatments were provided across four LGAs over four cycles with an average of 115% administrative coverage." Malaria Consortium, Monitoring and evaluation summary Nigeria, Pg 2. See Table 3, ACCESS-SMC multi-country cost analysis, January 2017, Pg 12. Regarding methodology, it notes: "The total number of monthly SMC cycles administered ranged from 308,830 in The Gambia to 3,147,869 in Nigeria (Table 3). Dividing the aforementioned numbers by four cycles yields an estimation of the equivalent number of children (3-59 months) who received four cycles of SMC. These figures can be compared with the initial target populations. The equivalent number of children (3-59 months) who received four cycles of SMC ranged from 77,208 in The Gambia to 787,467 in Nigeria. These equivalent figures do not represent the actual number of children (3-59 months) who received four complete cycles of SMC, which were fewer, as explained below. The SMC coverage percentages were calculated by dividing the equivalent numbers of children (3-59 months) reached by the estimated target populations. These ranged from 69.97% in Niger to 104.73% in Burkina Faso (see Table 3). SMC coverage rates of more than 100% were likely due to a combination of several factors: an initial underestimation of the target population; or children who came from outside the catchment area; or children outside of the age range of the target population (3-59 months) who received SMC. In general, the demand for SMC increased between the first and fourth distribution cycles with the exception of in Mali where SMC coverage decreased after the second cycle. Sample coverage surveys conducted in each country by research groups, coordinated by the London School of Hygiene and Tropical Medicine (LSHTM), showed that the numbers of children who received the full four cycles ranged from 22.7% in Chad to 69.2% in Burkina Faso, and the numbers of children who received at least three cycles of SMC ranged from 56.2% in Mali to 84.3% in The Gambia. According to the LSHTM coverage survey conducted in Niger, SMC coverage varied by district. In Aguié, 45% of eligible children received four cycles of SMC and 71% received at least three cycles of SMC. In Madaoua, 43% of children received four SMC cycles and 64% received at least 3 cycles. In Maradi, only 10% of children received at least three cycles and 25% of children received zero cycles. In Zinder, only 13% of children received at least three cycles and 63% received zero cycles.
" ACCESS-SMC multi-country cost analysis, January 2017, Pg 11. There appears to be some administrative data in ACCESS-SMC, summary administrative coverage spreadsheet, but we are not sure of the methodology underlying it or what year it is from. See Cell L14, GiveWell summary of SMC coverage information, November 2016. ACCESS-SMC monitoring and evaluation plan: Malaria Consortium, Annex III: evaluation of seasonal malaria chemoprevention, Pgs 13-14. Table 2, ACCESS-SMC M&E strategy, November 2015, Pg 10: "Responsible partner" for the "Project indicator" "Population coverage" is "LSHTM." Results and sources in this spreadsheet, sheet "Coverage." "One month after the last SMC cycle in 2015, and after the last cycle in 2016, a household survey will be undertaken to record the dates of SMC doses received that year. The survey will be done shortly after the last CMS cycle in order to minimise the time interval for recall." Malaria Consortium, Annex III: evaluation of seasonal malaria chemoprevention, Pg 13. "A two-stage cluster sample survey will be used to provide estimates of the proportion of eligible children who received 0,1,2,3 or 4 SMC treatments, representative of the areas where SMC is implemented." Malaria Consortium, Annex III: evaluation of seasonal malaria chemoprevention, Pg 13. "Sampling for the coverage survey: From a list of all communities (villages or census enumeration areas) in the areas that received SMC, about 60 communities will be selected with PPES [Probability proportional to estimated size]. In each selected community, a sample of an approximately constant number of households will be made from village lists or using area sampling. All eligible children resident in the household at the time of the survey should be included. If any children are away or the parent is not present to interview, a call-back visit should be arranged before documenting a non-response for that child or household." Malaria Consortium, Annex III: evaluation of seasonal malaria chemoprevention, Pg 14. "Sample size: About 10 children per community are required for a sample size of 600 this will give good precision on the overall estimates of coverage while permitting reasonable precision on sub-regional estimates. To allow for the fact that children up to 7 yrs of age will be surveyed, the sample size is increased to 14 per cluster (total 60x14=840). In vaccination coverage surveys in the Gambia, the rate of homogeneity (roh) for DPT3 was about 0.2, this gives a design effect of Deff=1+(b- 1).roh=2.8 for a cluster size b=10. A survey of 600 then corresponds to a sample size of 600/2.8=214 if we were to use simple random sampling and this would give, if the coverage was 70%, a margin of error (95% confidence interval) of +/-6%, if the coverage was 50%, +/-7%. And for sub-regional estimates, if we divide the area into three with 200 sampled in each of these three areas, the precision would be 50% +/-12% or 70% +/-11%. For estimating coverage in the out-of-range children (>5yr and 7<yrs), if we have about 4 of these per cluster, a total of 60x4=240, we would have a margin of error of +/-8% if the coverage was 20%." Malaria Consortium, Annex III: evaluation of seasonal malaria chemoprevention, Pg 14. For the three coverage surveys we have seen from 2017, the sample size exceeded 600 in each. Sources in this spreadsheet, sheet "Coverage." Regarding the definition of "eligible children": "Study populations: SMC is aimed at children aged 3 to 59 months old. Children who receive SMC at the first cycle of the year, but have their 5th birthday before the last SMC cycle, should continue to receive SMC that year, but will not be eligible next year. Therefore, in the survey, eligible children are defined as those who are aged at least 4 months at the time of the survey (hence would have been at least 3 months old when the 4th SMC cycle took place), and are aged less than 5 yrs and 4 months. However, it is possible that older children are receiving SMC and it will be useful to capture this. Therefore, in the survey, all children aged less than 7 years at the time of the survey will be included, and the date of birth and age carefully noted to allow estimates of coverage in the target age range to be made. The sample size will be increased to ensure the target number in the eligible age range is obtained. Care should be taken to obtain the correct date of birth, this should be noted from the child’s health card, where this is not available, the child’s age should be recorded as accurately as possible using an event calendar, and referring to children in the compound of similar age whose date of birth is known." Malaria Consortium, Annex III: evaluation of seasonal malaria chemoprevention, Pgs 13-14. Sources in this spreadsheet, sheet "Coverage." Regarding how SMC Record Cards are used: Our understanding is that CHWs are expected to record the first dose of each cycle and the date they gave the dose on a family's Record Card and that the family is expected to record all other doses. We have seen a few versions of templates for "SMC Record Cards." The latest version that we have seen (from 2016) is here: SMC Record Card Template 2016. "Children in endemic areas should receive SMC every month for up to 4 months in the transmission season. A key indicator that should be reported is the percentage of children that receive all of their scheduled SMC treatments. Provided SMC doses are accurately recorded on a family-held record card, this can be done through household surveys using a similar methodology to that employed for vaccination coverage surveys, but will need to be supplemented by asking mothers about treatments." Malaria Consortium, Annex III: evaluation of seasonal malaria chemoprevention, Pg 7. "Q62: Was (Name) given a card to keep record of the drugs given?...If No or DK => Q64." "Q64: Did the child take the first dose in the presence of the caregivers for each distribution cycle? Q65: Did you continue to give the tablets at home the following days?" ACCESS-SMC, Questionnaire for SMC coverage survey, Pgs 14-15. "SMC doses: Dates of SMC doses will be recorded from the child’s SMC card. In countries where administration of SMC doses was recorded electronically, a hand-held device will be used to read the QR code on the child’s card. The mother or carer should also be asked about receipt of SMC doses to cross-check the information on the card and to provide information about doses where the card has been lost. A short questionnaire, including reasons for missed SMC cycles, and adherence to the supervised and home doses, occurrence of fever in the child in the last 2 weeks and any treatment seeking for that fever, and the use of bednets by the child, will be completed. Where possible, a cross-check on SMC dates should be made from the SMC register." Malaria Consortium, Annex III: evaluation of seasonal malaria chemoprevention, Pg 14. Examples of questions are pulled from ACCESS-SMC, Questionnaire for SMC coverage survey and from Malaria Consortium emails (unpublished), November 23, 2016. Our understanding is that CHWs are expected to record the first dose of each cycle and the date they gave the dose on a family's Record Card and that the family is expected to the other two doses. The two data points we've seen were from the first two cycles in Burkina Faso in 2017. 24% and 56% of caregivers who reported that their child had been treated in the most recent SMC cycle had retained a blister pack. Sources in this spreadsheet, sheet "Coverage." This quote is pulled from an unpublishable source: ACCESS-SMC, Health impact data with edits from Malaria Consortium emails (unpublished), November 23, 2016. The original source wrote that if the probability of receiving SMC at each cycle is 88%, the expected percentage who would receive at least three treatments is 93%. However, assuming that the probability of receiving each cycle is independent of whether the child received other cycles we believe that the correct figure here would be 67%. See Cells AF4 and AF9 in GiveWell summary of SMC coverage information, November 2016. "The survey was conducted in the 2nd phase LGAs which had received one round of SMC in from July to October 2014. Information on SMC receipt at each cycle was predominantly obtained from SMC cards given to the caregivers and from verbal responses of sampled caregivers in cases where the card could not be obtained." Malaria Consortium, Nigeria SMC evaluation report, 2014, Pg 30. "At each survey round, the survey was designed using a two-stage cluster sampling for a sample size of 750 households from 30 clusters (30 clusters X 25 households) selected with probability proportionate to size." Malaria Consortium, Nigeria SMC evaluation report, 2014, Pg 7. "Sampling and sample size: The survey employed a two stage cluster sample design. However, only sampling at the second stage was done. There was no re-sampling of clusters (first stage) as similar clusters sampled at baseline were used." Malaria Consortium, Nigeria SMC evaluation report, 2014, Pg 4. "Stage one: Stage one involved sampling of the primary sampling units (clusters) which were the enumeration areas (EA), usually settlements. At each of the survey rounds, a total of 30 clusters were selected with probability proportionate to size from which both the household and child health components of the surveys evaluation were conducted." Malaria Consortium, Nigeria SMC evaluation report, 2014, Pg 4. "Stage two: The second stage involved initially listing all households per cluster (settlement) for all the 30 clusters. From this, 25 households were selected per cluster using systematic sampling. A household was defined as a group of people who usually take their meals together. For enumeration areas of more than 150 households, an equal size section approach was used, i.e. the cluster was divided into two to four sections of approximately equal number of households, and one section was selected using simple random sampling. All households in that section were then mapped and the sample drawn as described above. The sample size of children under five that would give 95 percent power to detect a difference between 10 and 15 percent in malaria prevalence would be 690 in each survey. Respondents for the household survey were the heads of the household, from whom information relating to the household were obtained. Caregiver of children age under five years were the main respondents for information around knowledge of malaria prevention and health seeking behaviour for febrile children and SMC. Both household and caregiver questionnaires were based on the respective Malaria Indicator Survey (MIS) modules to ensure a standard approach. All caregivers who were either permanent residents of the households sampled or visitors in the households on the night before the survey were eligible to be interviewed in the survey. All children 3-59 months who were listed in the household were eligible for the malariometric and anthropometric component of the survey." Malaria Consortium, Nigeria SMC evaluation report, 2014, Pg 4. "Table 2.1 below shows the response rates for both surveys. Both surveys had very good response rates with baseline response rate of 94 percent and 98 percent at endline. Interviews were conducted at the first visit to the household in more than 90 percent of the households at all survey rounds. Analysis was not weighted due to the invariability of information on cluster sizes." Malaria Consortium, Nigeria SMC evaluation report, 2014, Pg 7. "Table 3.1 below shows the geographic distribution of the households visited. A similar sample size was planned at both baseline and endline in the two LGAs. Results show that this was achieved with an equal sharing between Dutsi and Maiadua at the two survey rounds. Using Principle component analysis, households were classified into five relatively equal wealth categories based on their household possessions. Effort was made to use the same household characteristics at both survey rounds to enable comparability between the survey rounds." Malaria Consortium, Nigeria SMC evaluation report, 2014, Pg 8. See Table 1, Malaria Consortium, Nigeria SMC evaluation report, 2014, Pg 7. "Overall reported coverage of SMC (receipt of at least one dose of SMC) was very high at 83.9 percent after one round of distribution. The coverage was deemed equitable by social economic status and gender as coverage was similar across each category. Dutsi LGA had a significantly higher coverage (94.8 percent) compared to Mai’adua. 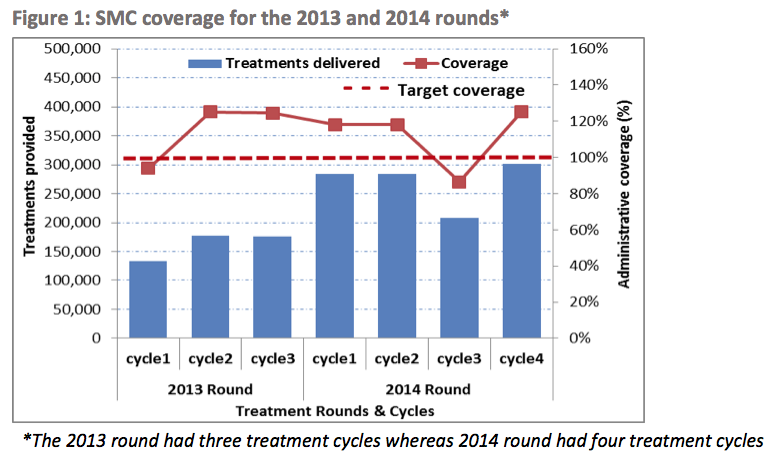 Coverage per cycle slightly declined at subsequent cycles from 75 percent in cycle one through to 55 percent at cycle four. This is in cases where information could be obtained. SMC distribution at each cycle was equitable. 61.8 percent of all children for whom data was collected received at least 3 cycles of SMC." Malaria Consortium, Nigeria SMC evaluation report, 2014, Pg 30. See Table 5.2.4, Malaria Consortium, Nigeria SMC evaluation report, 2014, Pg 28. It seems that a slightly different survey tool may have been used than is used in the ACCESS-SMC coverage surveys. Unpublished source. Malaria Consortium notes, "Preliminary results from 2015 also showed reduced malaria cases in children under 5 preliminary results: 65% Guinea; 49% Mali, 46% BF and 24% Chad." Malaria Consortium, comments on a draft of this page, October 2017. We have not seen more information on these results. "The impact of the SMC programme in reducing the number of cases of confirmed malaria treated at health facilities has been assessed using reports of cases in the national health management information systems (HMIS), and by collecting more detailed data on all of the individual cases treated from selected health facilities that have served as sentinel sites for measuring the malaria burden more accurately than is possible from the national data." ACCESS-SMC, Research progress update, April 2017, Pg 2. "Efficacy of SMC treatments will be measured using the case control approach. Malaria cases, and controls who do not have malaria, will be recruited concurrently, and the dates of the doses of SMC they received noted. The efficacy of SMC can then be calculated as a function of the time since treatment using case-control analysis. It is essential that dates of SMC doses are accurately documented, and that malaria cases are parasitologically confirmed. Controls will be selected from the community, in the neighbourhood where the case lived at the time they had malaria. Trained fieldworkers will collect information about cases and controls, and make home visits to record bednet use and other household factors that may act as confounders. Microscopy will be used to confirm cases and to measure parasite density. Controls will be confirmed to be negative for P.falciparum, by RDT." Malaria Consortium, Annex III: evaluation of seasonal malaria chemoprevention, Pg 10. "The objective of the molecular monitoring through the ACCESS-SMC project was to establish a baseline for monitoring the prevalence of the markers across the subregion using standardised methods, and to determine if there have been any important changes in the prevalence of these markers after two years of SMC at scale [...] The baseline surveys, before scale-up of SMC, showed very low frequencies of mutations associated with SP and AQ resistant genotypes. 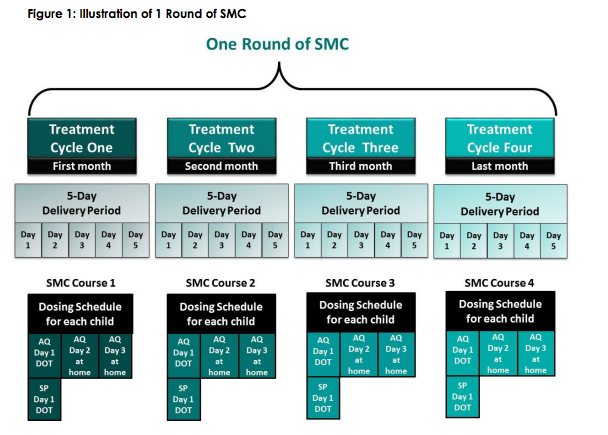 The markers indicative of resistance to SMC drugs are shown in the following table." ACCESS-SMC, Progress update - Resistance monitoring, pg 3. "This report presents an update on analysis of baseline survey data. A second survey is planned to be conducted in each country at the end of the 2017 transmission season. The baseline surveys were done at the end of the 2015 transmission season." ACCESS-SMC, Progress update - Resistance monitoring, pg 7. Malaria Consortium, comments on a draft of this page, October 2017. Malaria Consortium also notes, "The effects, if they occur, will be in children who had SMC for at least 3-4 years, and then stop / move out of the eligible age group. In practice, we’ve seen quite a lot of treatment in 6 and 7 yr olds, so will need to look to see any evidence for an increase in incidence in 8-9 year olds after the SMC has been running for a few years. Considering these aspects, it won’t be until 2018-2019 most likely that we would start seeing those effects if SMC continues. Now, if SMC stops abruptly, we may see some effects in older children (5yo) in areas that started before ACCESS-SMC (2013). There may be some of such areas in Burkina, Chad and Nigeria." We have seen one estimate from Malaria Consortium that suggested that roughly 0.5%-1.5% of children who received SMC drugs vomited. See Malaria Consortium, 2013 operational data. We have not vetted this estimate. We have not seen other information about vomiting in Malaria Consortium's monitoring. "It is very rare that children become sick after taking SMC medicines, but some children may feel a bit sick for a short while; what are some symptoms children may have? a) diarrhoea, b) itching, c) headache, d) mild abdominal pain, e) rash, f) a,b, and c, g) d,e, and f, h) All of the above, [Correct answer: H.]" Malaria Consortium Quiz Answer Key. "In Nigeria, there was a follow-up of a cohort of 10,000 children one week after each SMC cycle to ask about side effects, and to assess the frequency of mild and moderate side effects that may not be reported to the health facility. […] The 10,000 children cohort in Nigeria produced only five PV reports, and it seems to be linked to some reluctance to report by beneficiaries." ACCESS-SMC, Progress update - Safety monitoring, pgs. 7 and 10. ACCESS-SMC, Reported severe adverse events. Source for "The grant was originally set to cover SMC treatments in 2015 and 2016 and was extended to cover some treatments in 2017" is Diego Moroso, conversation with GiveWell, July 26, 2017. In April 2014-March 2015, it appears that about 11% of Malaria Consortium's total expenditure was unrestricted. See "Resources expended" from 2015 and compare "Restricted funds" and "Total funds" columns on Malaria Consortium, Trustees' report and financial statements 2015, Pg 17. Percentage of spending coming from restricted funds calculation: 50,626,000 British pounds / 56,809,000 British pounds = 0.89. Malaria Consortium told us that it often uses unrestricted funding to support overhead that is needed for some of the restricted grants it receives (sometimes funders' requirements do not allow it to spend on overhead), so these unrestricted funds are not available to support new programs and activities. GiveWell's non-verbatim summary of conversations with Malaria Consortium staff, November 7 and November 9, 2016. For a more detailed breakdown of how Malaria Consortium has spent unrestricted funds in the past, see Malaria Consortium, restricted and unrestricted expenditure analysis 2016. It seems possible that some of the funds spent on "Monitoring & surveillance of malaria" and "Malaria strategy support" supported aspects of SMC programs, but we are uncertain. Malaria Consortium told us that it agrees with the U.K. Department for International Development about how it will use Programme Partnership Agreement (PPA) funds. It told us that it decides which programs to apply for PPA funds with depending on what it believes will be most impactful, and then if it receives PPA funds it is committed to spending the funds on those programs. GiveWell's non-verbatim summary of conversations with Malaria Consortium staff, November 7 and November 9, 2016. Malaria Consortium told us that it does not expect to receive PPA funds beyond 2018. GiveWell's non-verbatim summary of conversations with Malaria Consortium staff, November 7 and November 9, 2016. Diego Moroso, Project Director for ACCESS-SMC at Malaria Consortium, conversation with GiveWell, August 22, 2017. We note that in October 2017, Malaria Consortium shared a summary of donor commitments for SMC in 2016-2020 that indicated that, for 2018, there were not yet sufficient donor commitments to fully fund eligible districts in Mali and Niger. This could indicate a funding gap or possibly that donor commitments have not been made but are likely in the future. Malaria Consortium, conversation with GiveWell, October 5, 2017. Malaria Consortium told us that it does not expect to receive PPA funds beyond 2018 due to the discontinuation of this funding stream for all recipients by the UK government. GiveWell's non-verbatim summary of conversations with Malaria Consortium staff, November 7 and November 9, 2016. See this spreadsheet, sheet "SMC donor mapping." "Some 23.7m children are eligible for SMC, the vast majority of who live in the Sahel region." ACCESS-SMC website, "The Project". Malaria Consortium told us that this estimate came from the WHO. Malaria Consortium emails (unpublished), November 23, 2016. Slides 11-12, ACCESS-SMC, presentation on cost and impact, June 2016. "Why is SMC not more widely available? Health ministries, donors and the private sector currently dedicate insufficient financial resources to expanding SMC, meaning resources for scale-up are not available." ACCESS-SMC website, "The Project".